Mine that is, not the movie title. The last few days have not been pleasant. The scam detailed in post below,carried out by Kerrie Allman and her business All Craft Media was very disheartening. This was made worse by the fact that it was not a one off occurrence. She has been disregarding designers' skills and rights and not paying for designs for a long time, it seems. Right back to Magknits, apparently. Yarn for clubs has not been sent and she has apparently lied about it being lost by Royal Mail on many occasions. There are lots of variations of lies and withholding goods as well. These are not isolated instances. All her staff were sacked last Thursday. Many of them had not been paid for at least a month, some longer. They basically were forced to work as if they did not go in, they were considered as breaking their side of the contract they held. That gave her an excuse to sack them. Editors have gone for months without pay. Lies and more lies. A friend said that it seemed out of character for the world of such a friendly, warm craft as knitting. I agreed with him but think that is one reason for her success. I've seen the generosity of knitters and other crafters in natural disasters here. One indie spinner has offered good yarn to all who lost out in the scam above. Others joined in to help with postage for her and some also offered yarn. As a group we trust people, we want to believe the best of them and this has opened us up to being exploited. So if you join a yarn club, do your homework. There are many wonderful people out there who sell amazingly good yarn. Their customer service is superb and they value their good reputation. And then there are the others who supply viscose which falls apart instead of silk or just happen to lose orders and keep payments etc and who bully their customers making them believe that they are at fault. So I decided to brighten my day and put on these tights which I bought a couple of years ago from USA. A firm called, I think, "I love Colours." Actually another good firm to deal with. There was a deal of free postage and the sizes were great as were the colours. I bought some navy, a red, deep green, this light purple, a denim blue and a grey. They lift my spirits when I put them on. They are like a bit of light hearted nonsense. Years ago when I was at Uni the first time, and that was years ago, I bought a bright red pair. They became my signature, everyone knew my red stockings. These are fun too. I'm a barefoot gal too, a reaction to my mother never allowing any of us to be barefoot except at the beach. In summer I am always barefoot in the house, although I put something on my feet to go outside. In winter I usually have handknit socks on inside but no shoes. Some of my socks are ten years old and none show signs of wear from wearing them without shoes on the carpet. However, I think this is going to be a cold winter. The apartment is very warm in the morning when the low sun streams in under the balcony roof, but the weather is quite cool and has been for some time. An early start to winter. I had a pair of sheepskin scuffs bought at KMart years ago. After a lot of use I pitched them and bought another pair last year. Definitely sheepskin on the outside but it seems the fluffy inside was not wool but something artificial. It hurt my feet and also was unpleasant to wear. It actually rubbed them raw in pressure spots. So I splurged on these. Definitely proper sheepskin, inside and out and they feel wonderful. They seem well made and look as if they will last a long time. The other horrible thing about the weekend was news I had when I logged on to a forum I've been a member of for many years. There was an RIP thread, so I looked. One of our valued members had been shot and she died later in hospital. She was an Episcopal (Anglican) priest in USA and was in the church offices with her admin officer. A homeless man living in some nearby woods had been given food from the church's foodbank. He came in and shot both of them. The admin officer was killed outright, Mary-Margeurite lived a few hours on life support in hospital. The man was later found in the woods. He had shot himself. Her parish is utterly shocked as were we all to hear of this . Just utterly horrible and I was not only horrified but very down about it all. She and I had had a a lengthy and lively email dialogue a couple of years ago when I was going through a dark spot. What she said was exactly what I needed to hear, but it was done in a gracious and loving tone. It seems from comments made that I was not the only one to have had such a dialogue with her. 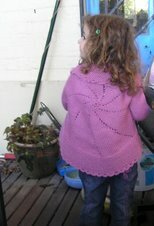 I've been concentrating on knitting the Brangian Shawl and don't have much left to do. It's been a comfort all weekend and will look lovely when finished. So sorry to hear about your online friend. I was thinking of you on Saturday - I was on the express bus from P. station to Central and happened to look up from my conversation with MIL just as the bus passed McDonalds. It happened again on the way home - coincidence? I think not! Oh my; I am taking a guess I know which forum and will head over there soon and see whom it was. I have not been keeping up-to-date there. May her memory be eternal! So sorry to read of the scam also. Oh that must have been a shock to read the news on your forum. Very sad. 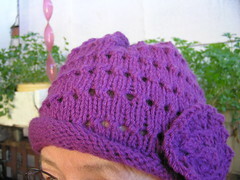 I read about the Magknits' woman's scam on The Ravelry. I think you are right, we want to believe the best of people. It is disappointing. Nice pink tights, very cheery and smart! !